Wilfried Voss, President of the Esd Electronics is the author of the book (ISBN 0-9765116-0-6) published by Copperhill Technologies Corporation. 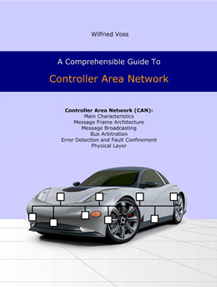 The 150-pages book provides an overview on the CAN data link layer protocol and some CAN physical layer approaches. The book addresses CAN newcomers. It explains the CAN protocol. Although the author criticizes the CAN specifications published by ISO and Bosch because of hard to understand and not precise descriptions, his book contains some minor faults regarding the CAN protocol (e.g. maximum error recovery time is 31 bit-times) and several features of the CAN protocol are not mentioned e.g. suspend transmission). Nevertheless, the book is a good starting point to learn more about CAN. A little bit strange is the redundancy in the description. The author repeats important statements, some of them several times. This may make sense from a didactic point of view. But to repeat also figures three times could only make sense to avoid paging back or to thicken the book. The book is also available as an E-book (PDF) by the publishing house.